The streets of Las Vegas can be dangerous when driving. If someone hits your car while you are on the road there are many questions that might stream through your mind. You might be injured and your car might be badly damaged. If this is the case, you need to know what the next best steps would be to get your life back to the way it was before some negligently hit your car. The first thing you might want to do is scream “Someone hit my car!” The next steps you take, however, are going to be vital in making sure you can get back to life as it was before the accident happened. Here are some pointers on what to do if someone else was at fault when they hit your car. Get Medical Attention (if needed): The first thing to do after you get his is to make sure that everyone in the car is OK. If someone needs medical attention, do not hesitate to call the paramedics before you do anything else. In many instances, the paramedics’ ability to respond in a timely manner can make all of the difference in the health and safety of the passengers in your car. Pull off the Road: The next thing you should do is to get yourself and your car off of the road and somewhere safe. Your individual safety is much more important than the need to preserve the scene of the accident. If your car will not move because it was too badly damaged, you should only exit your vehicle once you know that there are no more dangerous conditions that could cause you or your vehicle more harm. Call the Police: Don’t leave the scene of the accident and make sure that you call 911. In Las Vegas, the police are no longer responding to car accidents unless there is an injury reported. In fact, they will not even make a report if they happen to be close. However, if you can get them to show up and make a report on the incident, it will only help you prove that the other driver was at fault. Don’t worry if the police will not make a report. A police report is good evidence for negotiations with an insurance company, but it is not necessary—and much of it is not even admissible at trial. Exchange Information: Make safe contact with the driver of the other vehicle and get important information from them. Information like their name, address, phone numbers, driver’s license number, license plate numbers, and car insurance information will be vital in following up and making sure that they pay for the damage that he/she caused. If there are passengers in the other vehicle, try to also get their contact information. Remember to be cordial and you shouldn’t have too much trouble getting the info you need. However, do not offer any information to the other driver about the incident. In fact, let them do all the talking. If they want to admit guilt, let them. What you don’t want to do is unintentionally suggest that you might have done something wrong. Just get the info you need and move on. Talk to Witnesses: If there were witnesses, make sure that you gather all of their contact information as well. If the other driver decides to twist the story in a way that benefits him/her it will be helpful to have independent parties support your side of the story. You should gather any witnesses’ names, addresses and phone numbers. Take Pictures/Video: With a smart phone in your pocket you will be able to take pictures and video that can be very useful in determining who is at fault. It is not always easy to think of everything that you’ll need to do after you were in a car accident but taking photos and video on a cell phone will hopefully be an instinct you follow. Call Your Insurance Company: Make sure that you call your insurance company as soon as you can after things settle down a bit. Make sure that you tell them everything you know about the incident. Explain every part of the incident in as much detail as you can. If you were able to get a police report, make sure that you provide them with a copy. Get a Damage Valuation: Your insurance company will ask you to go to a car repair facility to get a damage evaluation. If you don’t like the valuation that they provide you with, you can always get a second or third opinion. If you and your insurance company cannot agree, you can always turn to mediation or speak with a lawyer. Keep Good Medical Records: If you need to see doctors to help you feel better after your car accident, be sure to keep good records. You will want to keep a record of which medical providers referred you to other medical providers. You will also want to make sure that you keeping a detailed account of money that you spend out of pocket as well. You can request copies of all medical reports and bills from your doctors as well which will probably help you prove your medical expenses. Settlement Offers: As a general warning, proceed carefully when you are settling your claim with an insurance company. Quick and seemingly easy settlements are typically not the best settlement for you. Make sure that you have confirmed all of your damages before accepting any offers from the insurance company. Some injuries can take days or weeks to reach their greatest discomfort levels. Don’t settle any claims unless you are absolutely certain that you are being properly compensated for all of your physical and property damage. Consider Hiring an Attorney: If there is an injury involved in a car accident, it may be best to consult with an attorney. Lawyers are well versed in dealing with insurance companies and they are able to maximize the total amount of money that will be paid out by an insurance company. Most Las Vegas personal injury lawyers work on a contingency basis which means that you only have to pay them if they are successful. If you are interested in speaking with a Las Vegas personal injury lawyer at Parry & Pfau, please call us at 702-879-9555 or click here to request a meeting. We would be happy to provide you with a free consultation. 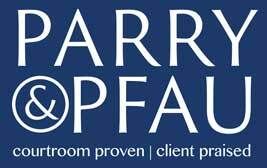 Matt Pfau is an attorney and founding partner at the law firm Parry & Pfau. Matt has a background in business consulting, estate planning, business start-ups and bankruptcy and is licensed to practice in both Nevada and California. A partner in the firm Parry & Pfau, he can be reached at 702-879-9555 or matt@p2lawyers.com. Young drivers have more than a one-in-three chance of getting into a car accident within their first year of driving.